Government policies related to taxes, spending, and interest rates. Fiscal policy is intended positively influence macroeconomic conditions. The primary debate within this field is how active a government should be. Proponents of a tight fiscal policy argue that government acts best when it acts least; they promote low taxes and spending and ideally limit government involvement to the setting of prevailing interest rates. Proponents of a loose government policy believe that government has a larger role in promoting economic well-being. See also: Reaganomics, Keynesian economics. The existing policy the government has for spending and taxing. Fiscal policy directly affects economic variables, such as tax rates, interest rates, and government programs, that influence security prices. See also monetary policy. The regulation of government expenditure and taxation in order to control the level of spending in the economy (see ECONOMIC POLICY). The fiscal authorities (principally the TREASURY in the UK), can employ a number of taxation measures to control spending: DIRECT TAXES on individuals (INCOME TAX) and companies (CORPORATION TAX) can be increased if spending needs to be reduced, for example, to control inflation, i.e. an increase in income tax reduces people's disposable income, and similarly an increase in corporation tax leaves companies with less profit available to pay dividends and reinvest. Alternatively, spending can be reduced by increasing indirect taxes: an increase in VALUE ADDED TAXES on products in general, or an increase in EXCISE DUTIES on particular products such as petrol and cigarettes will, by increasing their prices, lead to a reduction in purchasing power. The government can use changes in its own expenditure to affect spending levels; for example, a cut in current purchases of products or capital investment by the government again serves to reduce total spending in the economy. Taxation and government expenditure are linked together in terms of the government's overall fiscal or BUDGET position: total spending in the economy is reduced by the twin effects of increased taxation and expenditure cuts with the government running a budget surplus. If the objective is to increase spending then the government operates a budget deficit, reducing taxation and increasing its expenditure. In practice the application of fiscal policy as a short-term stabilization technique encounters a number of problems which reduces its effectiveness. Taxation rate changes, particularly alterations to income tax, are administratively cumbersome to initiate and take time to implement: likewise, a substantial proportion of government expenditure on, for example schools, roads, hospitals and defence, reflect longer-term economic and social commitments and cannot easily be reversed without lengthy political lobbying. From a technical point of view, changes in taxes or expenditure produce ‘multiplier’ effects (i.e. some initial change in spending is magnified and transmitted around the economy) but to an indeterminate extent. Practical experience has indicated that the short-termism approach to economic management has not in fact been especially successful in stabilizing the economy. As a result, medium-term management of the economy favoured by the monetarist school has, in recent years, assumed a greater degree of significance. (b) a decrease in government spending/tax increases (AD2 ). An instrument of DEMAND MANAGEMENT that seeks to influence the level and composition of spending in the economy and thus the level and composition of output (GROSS DOMESTIC PRODUCT). In addition, fiscal policy can affect the SUPPLY-SIDE of the economy by providing incentives to work and investment. The main measures of fiscal policy are TAXATION and GOVERNMENT EXPENDITURE. The fiscal authorities (principally the TREASURY in the UK) can employ a number of taxation measures to control AGGREGATE DEMAND or spending: DIRECT TAXES on individuals (INCOME TAX) and companies (CORPORATION TAX) can be increased if spending needs to be reduced, for example, to control inflation; i.e. an increase in income tax reduces people's disposable income, and similarly an increase in corporation tax leaves companies with less profit available to pay dividends and to reinvest. Alternatively, spending can be reduced by increasing INDIRECT TAXES: an increase in VALUE ADDED TAX on products in general, or an increase in EXCISE DUTIES on particular products such as petrol and cigarettes, will, by increasing their price, lead to a reduction in purchasing power. The government can use changes in its own expenditure to affect spending levels: for example, a cut in current purchases of products or capital investment by the government again serves to reduce total spending in the economy. Taxation and government expenditure are linked together in terms of the government's overall fiscal or BUDGET position: total spending in the economy is reduced by the twin effects of increased taxation and expenditure cuts with the government running a budget surplus (see Fig. 18 ). If the objective is to increase spending, then the government operates a budget deficit, reducing taxation and increasing its expenditure. A decrease in government spending and an increase in taxes (a WITHDRAWAL from the CIRCULAR FLOW OF NATIONAL INCOME) reduces aggregate demand and, through the MULTIPLIER process, serves to reduce inflationary pressures when the economy is ‘over-heating’. 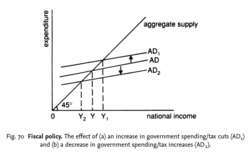 By contrast, an increase in government spending and/or decrease in taxes (an INJECTION into the circular flow of national income) stimulates aggregate demand and, via the multiplier effect, creates additional jobs to counteract UNEMPLOYMENT. Fig. 70 shows the effect of an increase in government expenditure and/or cuts in taxes in raising aggregate demand from AD to AD1 and national income from Y to Y1, and the effect of a decrease in government expenditure and/or increases in taxes, lowering aggregate demand from AD to AD2 and national income from Y to Y2. The use of budget deficits was first advocated by KEYNES as a means of counteracting the mass unemployment of the 1920s and 1930s. With the widespread acceptance of Keynesian ideas by Western governments in the period since 1945, fiscal policy was used as the main means of ‘fine-tuning’ the economy to achieve full employment. In practice, the application of fiscal policy as a short-term stabilization technique encounters a number of problems that reduce its effectiveness. Taxation rate changes, particularly alterations to income tax, are administratively cumbersome to initiate and take time to implement; likewise, a substantial proportion of government expenditure on, for example, schools, roads, hospitals and defence reflects longer-term economic and social commitments and cannot easily be reversed without lengthy political lobbying. Also, changes in taxes or expenditure produce ‘multiplier’ effects (i.e. some initial change in spending is magnified and transmitted around the economy) but to an indeterminate extent. Moreover, the use of fiscal policy to keep the economy operating at high levels of aggregate demand so as to achieve full employment often leads to DEMAND-PULL INFLATION. In the past the authorities have occasionally set ‘targets’ for fiscal policy, most notably ‘caps’ on the size of the PUBLIC SECTOR NET CASH REQUIREMENT (PSNCR). Recently, the government has accepted that fiscal stability is an important element in the fight against inflation. In 1997, the government set an inflation ‘target’ of an increase in the RETAIL PRICE INDEX (RPI) of no more than 21/2% per annum and ceded powers to a newly established MONETARY POLICY COMMITTEE to set official interest rates. In December 2003 the RPIX was replaced by the consumer price index and the inflation ‘target’ was reduced to 2%. In doing this, the government explicitly recognized that a low inflation economy was essential in order to achieve another of its priorities - low UNEMPLOYMENT (see EXPECTATIONS-ADJUSTED/AUGMENTED PHILLIPS CURVE). To this end, fiscal ‘prudence’, specifically a current budget deficit within the European Union's Stability and Growth Pact limits of no more than 3% of GDP (and an outstanding total debt limit of 60% of GDP) was endorsed as a necessary adjunct to avoid excessive monetary creation of the kind that had fuelled previous runaway inflations. In fact, the government has gone further than this in adopting the so-called ‘golden rule’, which requires that the government should ‘aim for an overall budget surplus over the economic cycle (defined as 1998/99 to 2003/04)’, with some of the proceeds being used to pay off government debt to reduce outstanding debt eventually to 40% of GDP. Along the way it has introduced more rigorous standards for approving increases in public spending, in particular the ‘sustainable investment rule’, which stipulates that the government should only borrow to finance capital investment and not to pay for general spending. In addition, the government has determined that it will ‘ring-fence’ increases in particular tax receipts to be used only for funding specific activities. For example, receipts from future increases in fuel taxes and tobacco taxes will be spent, respectively, only on road-building programmes and the National Health Service. See FISCAL STANCE, DEFLATIONARY GAP, INFLATIONARY GAP, KEYNESIAN ECONOMICS, MONETARISM, MONETARY POLICY, BUSINESS CYCLE, PUBLIC FINANCE, BUDGET ( GOVERNMENT), CROWDING-OUT EFFECT, STEALTH TAX, INTERNAL-EXTERNAL BALANCE MODEL, I-S/L-M MODEL. In fiscal policy reaction function, coefficient of output gap ([[gamma]. The objective of this part is to explain the effects of an expansionary fiscal policy needed to counter the effects of an economic crisis. The ability to use fiscal policy in a downturn can take the pressure off monetary policy to act as a policy shock absorber in a downturn. Uncertainty remains about how large a proportion of the positive growth prospects can be accounted for by the fiscal stimulus packages, but a highly expansionary monetary and fiscal policy has undoubtedly helped to make the macroeconomic picture more positive already this year. Fiscal policy and financial crises--what are the actual effects of fiscal policy? Inconsistencies between monetary and fiscal policy frameworks are most likely to become apparent in times of economic stress. The post EU finance ministers call for prudent fiscal policy appeared first on Cyprus Mail . Fiscal policy together with structural reforms, therefore, will now have to play an even bigger role than before in inflation control. A key finding includes the contribution of fiscal policy to global growth is poised to rise in the coming years. Why has fiscal policy often been procyclical in emerging markets? We extend a model of Chari and Kehoe (2008) to show that because England is so much larger than the other constituent nations of the UK, its fiscal policy choices will have a commensurately stronger impact on UK monetary policy. A universal base for information for decision-making in the area of fiscal policy will be formed. Starting with the recessionary period itself, McGranahan and Berman show that fiscal policy was more expansionary during the Great Recession than in any other recession since 1960.